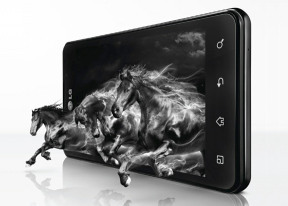 The LG Optimus 3D Max, just like its predecessor, comes with both the standard Android gallery and a custom 3D Gallery app. The standard gallery is well familiar, with folder layout for images and videos. Pinch zooming and sorting by date are enabled. There are plenty of options when viewing a single picture - you can crop or rotate it directly in the gallery. The Send feature offers quick sharing via Facebook, Twitter, Picasa, Email or Bluetooth. Zooming and panning is fast and smooth, but for a minor lag before the actual panning (or zooming) starts. Actually, there are some changes to the standard gallery - it recognizes which photos are 3D and puts a small "3D" logo on their thumbnails. It also sports a 3D toggle when viewing those images individually. You can enable 3D viewing on any image, and the 3D conversion works - the processed images look almost as good as those originally shot in 3D. There is of course a dedicated 3D Gallery app too, accessible from the 3D Space UI. It offers a couple of viewing modes, effectively two different types of carousels made of 3D images and videos. It looks good and runs smoothly, but it's not particularly feature-rich. In fact, it's mostly there for show. Vast collections could be a pain to navigate, especially since there's no way of sorting the content by date or type and even the simple, but useful grid view is missing. A useful option when looking at a single image is to choose the depth of the 3D effect. We didn't see the need to move it from its default maximum position but changing it might improve the viewing experience for others. The music player is the polished app we first saw on the Optimus 2X. It can do the usual filtering by album and artist and you have alphabet search and regular search for finding songs quicker. The Now playing interface is centered around a big album art image with player controls above and below it. Swiping the album art left or right is the easiest way to skip a song back or forward. A press and hold on the album art will bring up a menu to search - for the title, the artist or the album. After that you can pick where to search - your music collection, YouTube or a general Internet search. There are equalizer presets available, which work only with headphones. You can't create custom equalizers, but the selection of presets is very wide. Flipping the phone on its side reveals a cover flow of all the albums you have in your music collection. Tap on an album and you'll see a list of all songs in it. There's an alphabet scroll at the bottom of the screen to make finding albums faster. There's an FM radio with RDS in the LG Optimus 3D Max. It can play over the headphones or the loudspeaker, but the headphones need to be plugged-in either way (they act as an antenna). The video player has a fairly simple interface - it's just a list of all the videos on the device. There's an alphabet scroll to help users locate videos faster but that's about it. Native 3D videos are marked with a "3D" icon. The interface during playback is nothing overcomplicated either - there's the scrubber to skip to some part of the video along with the play/pause, next and previous buttons. There's an extra button to lock the screen during playback and there's a 3D toggle. While in 3D mode, there's an option to adjust the 3D depth, just like in the gallery. By the way, enabling 3D on a 2D video triggers software conversion, which creates a passable 3D effect. The LG Optimus 3D Max handled just about every video file we threw at it - the usual 3GP and MP4 stuff along with WMV and AVIs using DivX and XviD encoding. 1080p videos played well too. The Optimus 3D Max even handled MKV files - a very common container for HD content, which really sold us on the video player. Subtitles worked fine too, with settings for font and size. You can toggle subtitles on and off, but there's no option to manually load subtitles (so the subtitle filename has to match the video filename). There are some issues that need to be addressed though - only English subtitles worked, any there's no support for non-Latin characters. UTF encoding didn't help either. Also, to change the HDMI output resolution settings, you'll have to access the main Android settings - you can choose from 1080p, 720p and SD resolutions, so even old TVs (e.g. ones that support only up to 1080i) should work. The LG Optimus 3D Max P720 fared pretty well in our audio quality test. It's not the best we have seen, but it's good enough for everybody, but the most demanding audiophiles. When connected to an active external amplifier, the LG Optimus 3D Max got some pretty impressive scores for dynamic range, distortion levels, stereo crosstalk and signal-to-noise ratio. Its frequency response is spot on for the most part with only a small drop to be noticed in the extremely high frequencies. 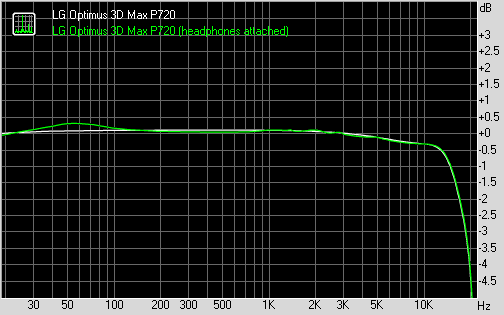 The most unpleasant effect of connecting a pair of headphones to the 3D Max is the huge increase in stereo crosstalk. Its really among the worst performances we have seen in that aspect, but the rest of the readings remain very good, so overall it's not too bad.